The Doctor is back! Having crashed landed in Victorian London, the recently regenerated Time Lord comes to the aid of Strax, Jenny and Vastra as they investigate a series of mysterious deaths. But can Clara trust this new face? And just what is a T-Rex doing in the Thames? Spoilers, of course, beyond the cut! Well, starters for ten, let's kick off at the very beginning - a new title sequence and theme! Based on Billy Hanshaw's excellent fan-made titles, they're a huge departure from what we've seen from Doctor Who post-2005, and if anything, a return to more classic-series sensibilities - The titles for Nine, Ten and Eleven were all very literal ideas, the TARDIS travelling through the Time Vortex. The new titles still do this of course, but the vortex takes on the more metaphorical aspects of Space and Time, instead opting for the symbolism of clockwork and planets to represent those ideals. It's the most subtle of changes to the base concept, but a really well implemented one - they look great. And the new theme more than matches the titles, thumping basslines and an eerie howl for the main melody sound fantastic and completely unlike the themes we've had in the revived series so far. We've lost that little opening melody that defined Matt Smith's era, and replaced it with something stark and instantly likeable. It's emblematic of the show's new approach - a lot of the pomp and grandeur has seemingly been stripped away to give us something new. Moffat's script makes excellent use of the full 75 minutes here - it's slow and it's measured, but for once it doesn't feel like that's a problem. A slower story is more than welcome after The Time of The Doctor's terribly rushed plotting at Christmas. 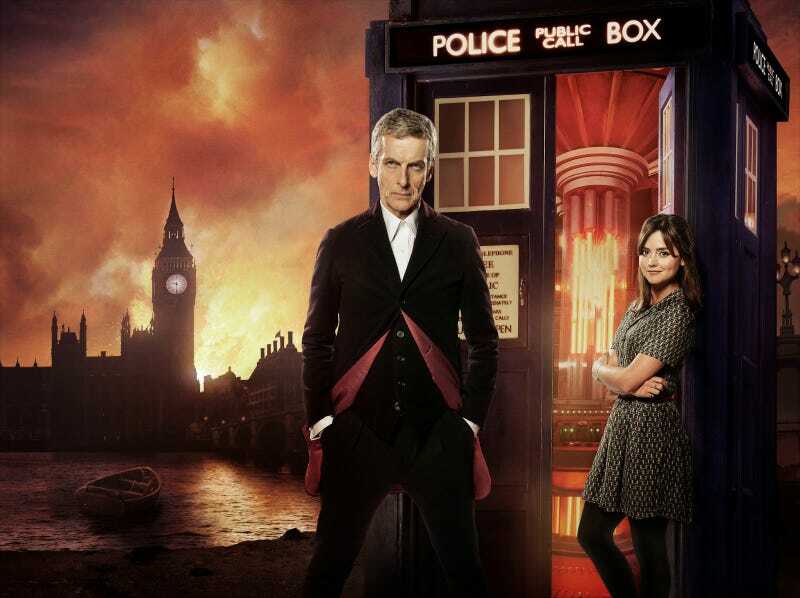 The story builds to a gruesome climax, but on the way it's always about our two leads, The Doctor and Clara. How does a Time Lord cope with a new face, a face he knows? How does his companion cope not knowing who he is? Not a moment is wasted, but its best put to use to allow Deep Breath to, well... breathe. Gone are many of the hurried scenes that defined the Eleventh Doctor's run, off at a million miles a minute, (although a lot of the humour is still there - from Jenny's ecstatic applause for Clara's rebuttal to Vastra, to Strax's less than grand entrance into the droid ship, it's surprisingly Twelve who gets the bulk of the good joke lines. He's quite funny under all that seriousness!) and instead scenes are much longer, the dialogues are allowed space to mingle and come together in a much more measured fashion. The sequence with The Doctor and Clara at the restaurant stands out as one of the most intriguing moments of acting in Doctor Who for a long time, and there's no explosions, no action, no sweeping Murray Gold orchestrations. It's Peter Capaldi and Jenna Coleman sitting together, talking to each other and inadvertently discovering that something's awry, and it's brilliant. Speaking of which, our two leads turn in some cracking performances. Naturally Capaldi's twelve is the focus, dashing from jokiness (that quip in the midst of his regenerative delirium of 'Don't look in that mirror, it's absolutely furious!' is delivered pitch perfectly) to fury and all between before settling on a more serious tone, it's Clara who really stands out. She's not only given time on her own to be the hero, but as a foil to Capaldi's Doctor it feels like she's finally being given the material she deserves after series 7B kind of left Clara feeling a bit bland, despite her dazzling chemistry with Matt Smith - something thankfully not lost between Jenna and Peter. On their own Peter and Jenna are great, and Deep Breath is very much defined about what one is like without the other, but together we're beginning to see what could be one of the most interesting Doctor-companion relationships we've had in the show for a while. I can't wait to see how they develop, and how Danny Pink fits in, over the course of the series. Visually the show has never looked better - Ben Wheatley's sublime direction offers something of a raw bent to the story. It doesn't feel typically cinematic as Doctor Who has been recently - and that is most definitely not meant as a knock - but there's a starkness to it, a reality that at times clashes with the absurdity of what we're seeing on screen amidst half-faced men (eeeew! An amazing blend of CGI and prosthetics there), giant dinosaurs and hot air balloons made out of skin (double eeew!). It works for this Doctor, and mixed with a more sombre, darker-toned colour palette, Deep Breath stands out in direct contrast to the house style pushed by the Moffat era. Wheatley's defining look for Twelve will cross on into the next episode, Into The Dalek, which he also directed and hopefully this sort of style is something that's picked on by the other Directors. It looks great - although some of the CG and framing on some of the actions sequences, especially The Doctor on horseback, looked decidedly ropey at points. It's Eleven! So that's why the phone was dangling out of the TARDIS just before he regenerated in The Time of The Doctor. Very Moffaty, but still clever. Honestly the moment it happened it felt a little much to have Matt cameo even though he's practically only just gone, but the way it comes together, Twelve and Eleven sounding off, it's a brilliant symbolic sign of acceptance for both Clara and fans unsure of this new, baffling and heavily-eyebrowed man - we'll always remember when The Doctor was Matt, but this new face is still that man, no matter how unsure of his ethics he is. Missy!? It's shocking to see this supposed guest-star from the finalé showing up now, but it's setting up an overarching theme for the series in an interesting manner. Why are dead people showing up in the Nethersphere, in 'Heaven'? What are Missy's plans for them? We'll be finding out in a few months, it seems... welcome back, Doctor. You've been missed!